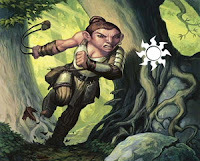 The other weekend, I was yattering with another Magic player, who, like me had just started playing and had some questions regarding the rotation of blocks out of standard play. With the announcement of the new set of Eventide today on Magic Arcana, I thought this would be an appropriate post. A block is a set of three story-based editions, typically beginning with a large expansion and followed by two small expansions. In general, every 12 months a new block is released. This does not hold true for the 'mini-blocks' of Lorwyn and Shadowmoor which contain only two sets of cards each. My friend's question concern the length of time he would be able to play his new Morningtide cards during our regular Friday Night Magic (FNM) games. FNM in our neck of the woods is typically Magic games using 'Standard' player-constructed decks. Standard is the format defined by the current block, the last completed block, and the most recent core set. The current Standard card pool consists of Time Spiral block, Coldsnap, the Tenth Edition core set, and "Lorwyn" block. For a list of all the blocks and their respective sets, visit Magic: The Gathering's website. Sets only rotate out in October. This October (10/01/2008), the two previous blocks of Time Spiral and Cold Snap will rotate out of Standard play. 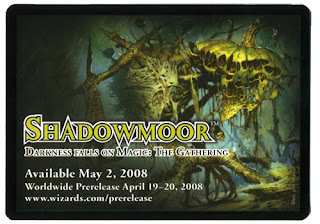 It is expected that the 'mini-Blocks' of Lorwyn and Shadowmoor will be treated as one large Über-Block for Standard and will not expect to have it rotate out of Standard until October, 2009. 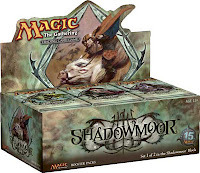 This leads to a controversial point; With an average of three or four new sets being released each year, some players complain that it requires a substantial investment to maintain a current deck for Standard Magic play. If I have a date incorrect, please feel free to leave a comment or send me an eMail. I attended a Morningtide Release party at my local store, OMG Games, here in Barrie on Saturday. Some 18 players were in attendance for this event. The tournament held was 'sealed deck' in which players received one sealed deck of 75 random cards consisting of 45 game cards and 30 basic lands. Also provided was three Morningtide Booster packs which include 15 random cards. From this 'mess' of 120 cards, participants attempt to build a deck with which to play against other opponents . . . easy right ? 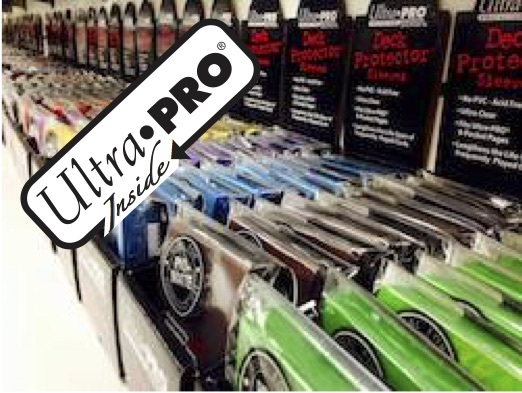 One beneficial aspect of a sealed deck format is that one only is required to build a deck of 40 cards instead of the typical 60 common to most other formats. The first step one should take is to sort the cards by their respective colour to determine the number and strength provided in each colour. As it is very rare for a player to be able to pull a sufficient number of cards for a mono-coloured deck, it is expected that at least two colours are to be used. One of the most important skills to have in Magic is card evaluation. Experienced players will be able to quickly assess which cards would be suitable for inclusion as well as knowing which other cards may provide synergies or use in combinations. Participants at this event had 50 minutes in which to build their decks. Here is a brief look of what I received. RED - 26 Cards; 11 elemental creatures, 7 goblins, 1 changeling, and 7 instants / sorceries / enchantments. Included among other decent commons, was Nova Chaser (rare 10/2 with trample), Vengeful Firebrand (rare 5/2 with conditional haste), Brightearth Banneret, War-Spike Changling, Stingmoggie, Stomping Slabs, and Inner-Flame Igniter. A red goblin Sensation Gorger (rare 2/2 with kinship discard ability) was also in the mix. Given the last goblin card, I then looked over my support in black which did not look that bad. BLACK - 23 Cards; 11 goblins, 2 elementals, 2 treefolk, 3 Elves, 1 faery, 1 changeling, and 3 instants / sorceries / enchantments. Included in this lot was the very lovely Nettlevine Blight (rare milling enchantment), Stinkdrinker Bandit (uncommon 2/1 with prowl and conditional pump), a pair of Prickly Boggarts (common 1/1 with fear), and a Moonglove Changeling (common 2/2 with payable deathtouch). WHITE - 20 Cards; 6 Kithkin, 3 Giants, 1 Changeling, 1 Elemental, 1 Merfolk and 8 instants / sorceries / enchantments. A fairly poor turn-out with only 3 cards of any note. Austere Command (rare sorcery with table-clearing ability), Cloudgoat Ranger (uncommon 3/3 a token generate with 'tapable' flying ability), and Cenn's Tactician (uncommon 1/1 with payable pump ability). GREEN - 16 Cards; 6 Elves, 3 Treefolk, 1 Shapeshifter, and 6 instants / sorceries / enchantments. Cards of note within this colour included Eyes of the Wisent (rare elemental tribal enchantment), Wolf-Skull Shaman (uncommon 2/2 kinship wolf-token-generator), and the highly desirable Imperious Perfect (uncommon 2/2 tribal pump and payable elf-token-generator). Where I went terribly wrong . . . I have been playing Magic for approximately one month (just a week before starting this Magic Blog). In a flash, my 50 minutes of deck-building had expired and participants were ready to play. In somewhat of a panic, I decided to play the cards with with I had some limited familiarity with - blue and white. Quite possibly the worst choice here. After having won the first match and lost the next three, I retreated back home, had a coffee and looked over my cards once more. Writing this blog post has also assisted me greatly in understanding where I went wrong and how to improve next time.